In Xishuangbanna Tropical Botanical Garden, the visitors may encounter a peculiar tree: there is not even one leave on the tree and the tree has only green branches and twigs. If a small twig is broken or a piece of bark is scraped, some white milk will seep out. When guides take visitors to such a tree, they may tell the visitors jokingly: �This tree is called single tree (milk bush); unmarried young fellows can not touch it, otherwise you would remain single all life long�. Milk bush often attracts people�s curiosity because of its strange name and shape. 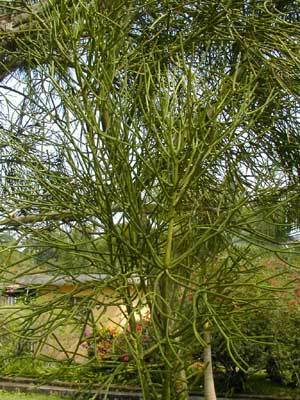 Milk bush can grow as tall as 4-9 meters and its native land is the tropical desert in East and South Africa. Its white milk is poisonous, and people should pay special attention when planting them or watching them. Remember never to let the milk enter the mouth, ear, eyes, nose or wounds. The poisonous milk can also help the tree resist the attack from diseases and insects. Besides, the experiments illustrate that the milk has a rich content of hydrocarbon, and is a kind of prospective gasoline plant. Why milk bush has only green branches instead of leaves? In its long-term evolvement, in order to fit the environment, plants often have aberrances. The native land of milk bush � the deserts in Africa, often has scorching suns and seldom has any rain. Because of serious shortage of water, many animals and plants died away or even got distinguished. The fittest survives. In order to suit unfavorable natural conditions and to resist drought and save water, the originally verdant leaves of milk bush degenerated and disappeared. In the meantime, its branches and trunks turned into green, which could have photosynthesis just like green leaves. Plants cannot live without photosynthesis, and their green color is an important condition for photosynthesis. In this way, milk bush survived. However, if milk bush is planted in warm and humid places, they can not only survive easily, but also grow some small leaves! This is also a kind of adaptation to the environment: leaves growing out can improve the evaporation capacity, and consequently achieve the balance of water in its body.